Interesting though this study is, it missed the opportunity to delve a little deeper into the influence that essential oils can have on cognitive performance. Whilst the study shows that the performance of test subjects was indeed affected by both lavender and rosemary essential oils, these results hardly come as a shock to anyone familiar with aromatherapy. Perhaps it’s just me, but I don’t really see the point in repeating research already conducted to re-confirm for the 100th time that lavender essential oil can produce a state of relaxation. It looks like the only thing new here is identifying that the subjects were so relaxed their reaction times were impaired and they couldn’t remember a part of the test! 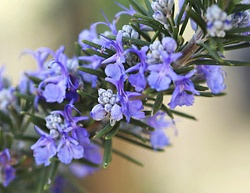 Likewise, lot’s of previous research has shown that rosemary essential oil enhances performance and memory. There’s nothing really new here either. Such a shame, when there are so many fascinating subjects to explore in aromatherapy. That said, the more research that is conducted into the effects of essential oils, the better. The fact that more researchers are prepared to invest time into conducting research like should certainly be seen as good news for all concerned. This study was designed to assess the olfactory impact of the essential oils of rosemary (Rosmarinus officinalis) and lavender (Lavandula angustifolia) on cognitive performance and mood in healthy volunteers. One hundred and forty-four participants were randomly assigned to one of three independent groups, and subsequently performed the Cognitive Drug Research (CDR) computerized cognitive assessment battery in a cubicle containing either one of the two odors or no odor (control). Visual analogue mood questionnaires were completed prior to exposure to the odor, and subsequently after completion of the test battery. The participants were deceived as to the genuine aim of the study until the completion of testing to prevent expectancy effects from possibly influencing the data. The outcome variables from the nine tasks that constitute the CDR core battery feed into six factors that represent different aspects of cognitive functioning. Analysis of performance revealed that lavender essential oil produced a significant decrement in performance of working memory, and impaired reaction times for both memory and attention based tasks compared to controls. In contrast, rosemary essential oil produced a significant enhancement of performance for overall quality of memory and secondary memory factors, but also produced an impairment of speed of memory compared to controls. With regard to mood, comparisons of the change in ratings from baseline to post-test revealed that following the completion of the cognitive assessment battery, both the control and lavender groups were significantly less alert than the rosemary condition; however, the control group was significantly less content than both rosemary and lavender conditions. These findings indicate that the olfactory properties of these essential oils can produce objective effects on cognitive performance, as well as subjective effects on mood.